Over the summer Pittsburgh has become home to some new BYOB restaurants in the area, many of which we plan to try. Our first, Bite Bistro, has set the bar pretty high on what we’re going to come to expect from this 2011-class of restaurants. Bite Bistro is located on Lincoln Ave in Bellevue in the location formerly occupied by Vivo. Despite some very warm weather last week, we ventured through the sweltering humidity to Bite and found ourselves experiencing some new tastes that we can’t wait to share with our wine exchange friends. The menu is representative of some French influence, but Bite makes it all its own. Dinner began by oggling the variety of options on the menu, found not in printed format, but on a chalkboard in the dining room. Using the day’s freshest ingredients, the cooks change the menu up based on what’s available. I started my meal with a soup of potato and scallions. After ordering, I sat puzzled why I would ever order a warm soup on such a hot day. The warmth of the soup was overshadowed by the thite-brothy soup that was actually light and flavorful as if it had simmered all day. I found it pleasantly unlike most potato soups which are very thick and heavy. 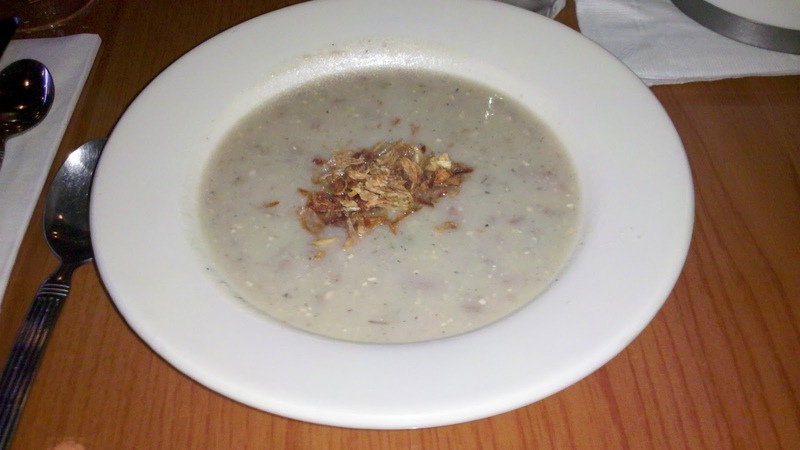 I also envisioned fresh sliced green scallions throughout the soup, but instead the soup was topped with some very fried scallions – I love surprises. 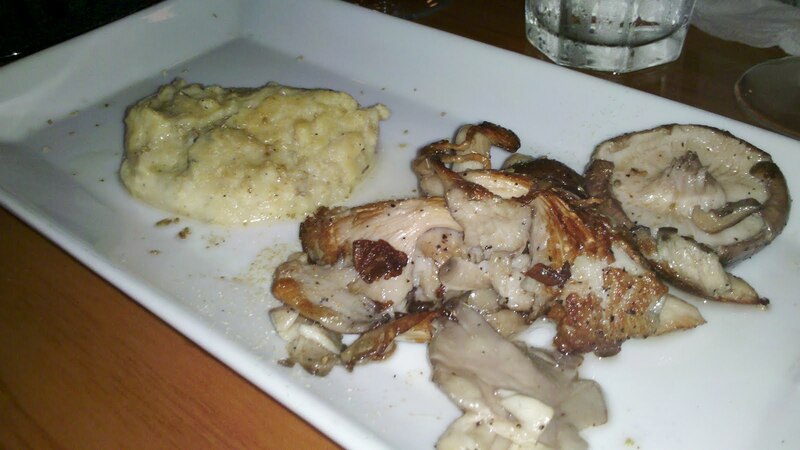 As a shared appetizer, TasteBudA and I split the Wild Mushrooms and Polenta. The first bite was heaven. As we continued to eat, we convinced ourselves that cooking the mushrooms in a bacon fat was a genius idea. However, when the waitress returned, she informed us that it was not a smoky flavor we tasted, it was in fact a walnut oil. The dish was the first vegan dish TasteBudA has ever truly enjoyed. 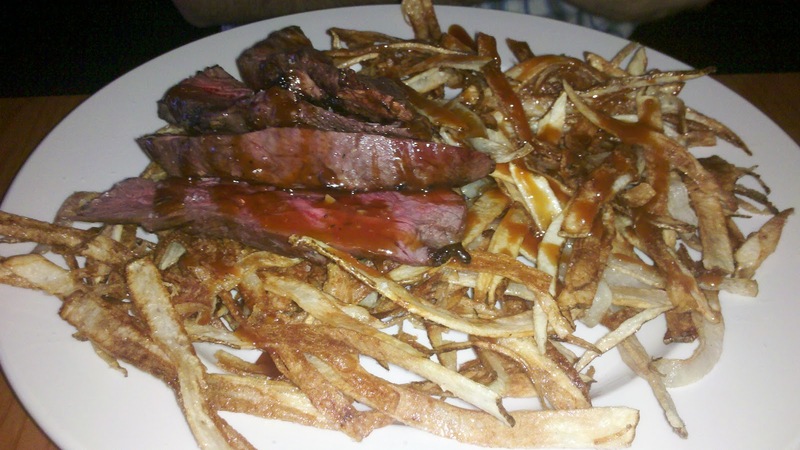 For our entrées, TasteBudA made the wise choice of a flank steak and frites. I was jealous, because the “fries” were very crispy, as frites should be, and topped in a house-specialty Bite-sauce to die for. 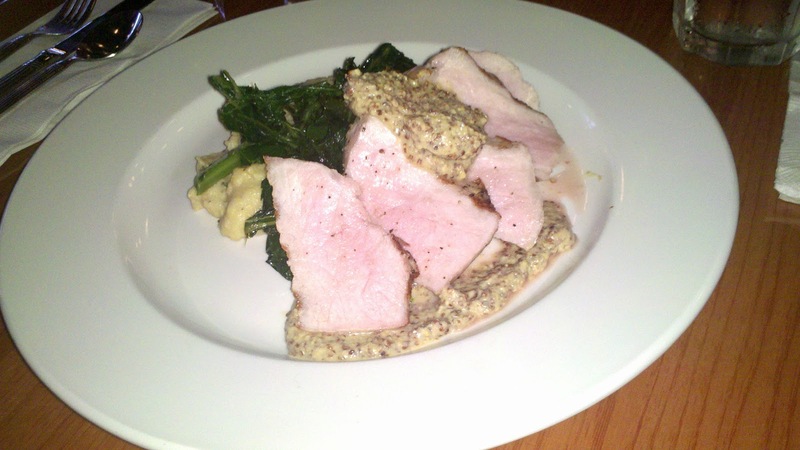 My main course was sliced pork loin over collard greens and polenta. The pork was excellently cooked. In my opinion, the items on the plate weren’t complimentary, but individually, each item was well executed and tasteful. After a spectacular meal, we asked to see Perque, the “underground” party room inside Bite Bistro. This space is often used for musicians, comedians and other entertainment, so we wanted to check it out for a potential wine exchange. 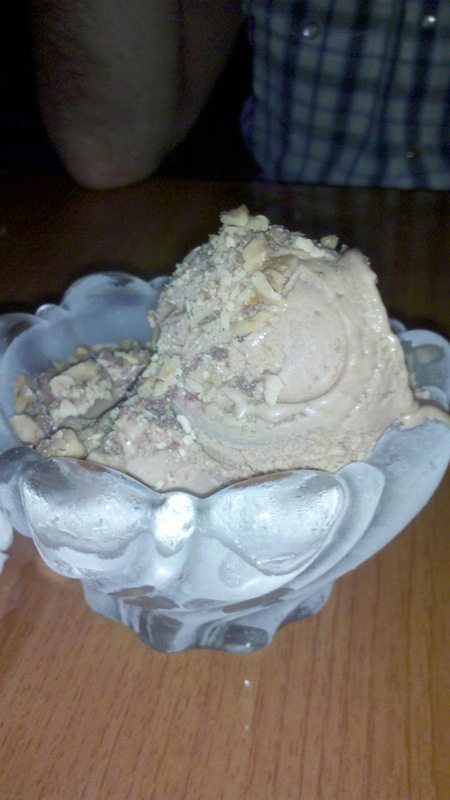 Following the downstairs tour, we endulged in an ice cream dessert, which if I recall was inspired by a Heath Bar. We encourage folks to have a bite at Bite. Unfortunately we can’t guarentee that you will have the same menu offerings we had, but if our meals spoke to the quality of the food, then we assure you that you won’t be disappointed when you go either.